I was unprepared for how pissed I was. I know I know, there are a lot of things happening in the world right now that would be better beneficiaries of my outrage. But in a small way, this garden was my response to that. It was supposed to be the one corner of my world that I could control. Was it Rachel Carson who wrote “control of nature” was a phrase conceived in arrogance? We had gotten arrogant. In our minds we’d done everything we could to keep out the invaders and in the eight weeks since planting, had seen no evidence of break-ins. We fortified the fences around our yard, we netted the beds, we sprayed some natural repellant around the perimeter. But I guess all it takes is one chink in the armor. We’re working with our neighbors to come up with a battle plan going forward, but I feel defeated and I can’t stop picturing those f**ers whispering rookies to each other as they laughed their full bellies the whole way home. It took me full day to recover and actually approach the garden again. And when I did, I felt like Marlin in Finding Nemo after the shark attacked (and consumed) his entire anemone, including the family nest containing thousands of the about-to-hatch eggs he had been guarding with his wife. And I felt like Marlin when I spotted my very own Nemo, the cucumber shown up top, the lone survivor of The Attack, hiding under a tangle of weeds and vines. I cleaned and coddled the thing like it was made of solid gold, then placed it on the counter hoping I’d figure out a preparation to properly acknowledge that it represented the entirety of my 2017 harvest. 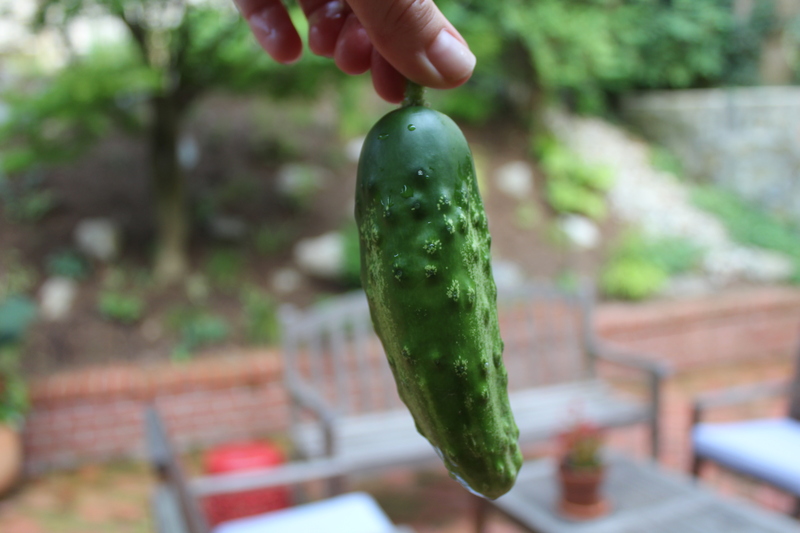 Perry’s Cucumbers, seemed a good place to start. There were recipes for Soba Salad with Cucumbers, Soft Tofu and Chile Oil (yum), Cucumbers with Fried and Pickled Shallots, and Sweet Onion Cucumber Sandwiches with Mustard Butter. In the end, I guess it makes sense that my survivor found its way into a good stiff drink, her infused gin and tonic that only called for “one to two” cucumbers. (I affixed a “Do Not Drink” label on it so my daughters didn’t mistake it for some kind of spa water concoction.) Let me just say: It went down easy. Recipe Note from Dawn: Keep in mind that every gin has its own unique balance of juniper and botanicals. Plymouth is my favorite brand because it’s silk smooth, kind of grassy and really sings with the addition of cucumber. (Beefeater is another fine choice.) I don’t particularly like highballs — they go down too quickly — so I serve this in a rocks glass. Whatever you do, be sure to use plenty of ice and a fresh bottle of bubbles: tonic to make a G&T, or club soda for a gin rickey. 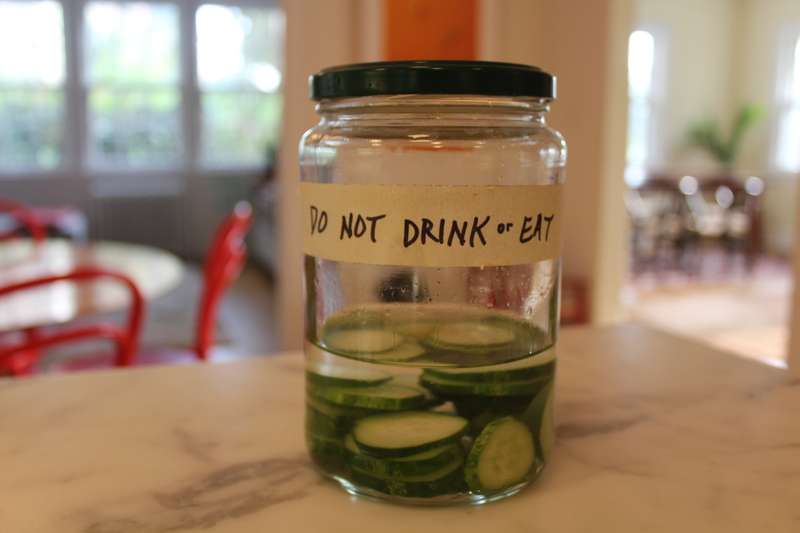 In a resealable container (preferably a glass one), combine the gin and cucumber and shake to combine. Set aside in a cool dark place for 5 to 7 days, shaking the jar gently when you remember to. Using a fine-mesh sieve, strain the mixture into another glass container and discard the cucumbers. Place 2 ounces (1/4 cup) of the gin in a rocks glass and fill the glass with ice. Top with tonic or club soda and a squeeze a big lime were over the top. Repeat to make 3 more drinks and serve. 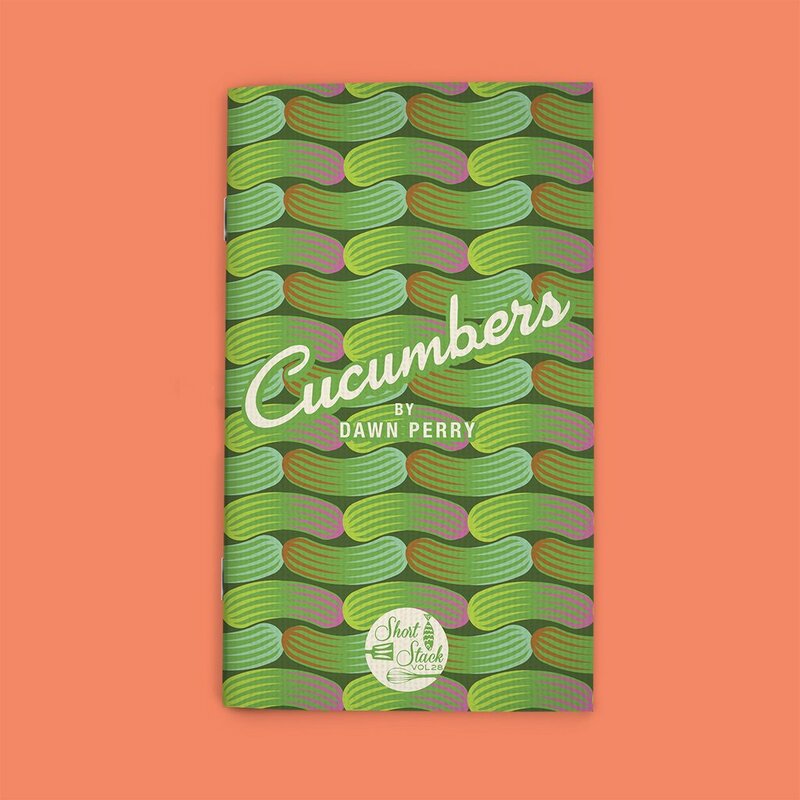 Pick up Cucumbers (and check out all their other volumes) over at Short Stack Editions. Thanks Dawn, thanks Short Stack! I’m so sorry about your garden! I started my first garden this year, and I have been forced to learn about many diseases, pests, and other problems as they come. I’m trying to call this my “learning year,” but man, I’m still lamenting the summer squash plants that were obliterated by cucumber beetles. I got ONE SQUASH. It’s devastating to lose something you worked so hard on literally overnight. Drink to stronger fences and trying again next year! 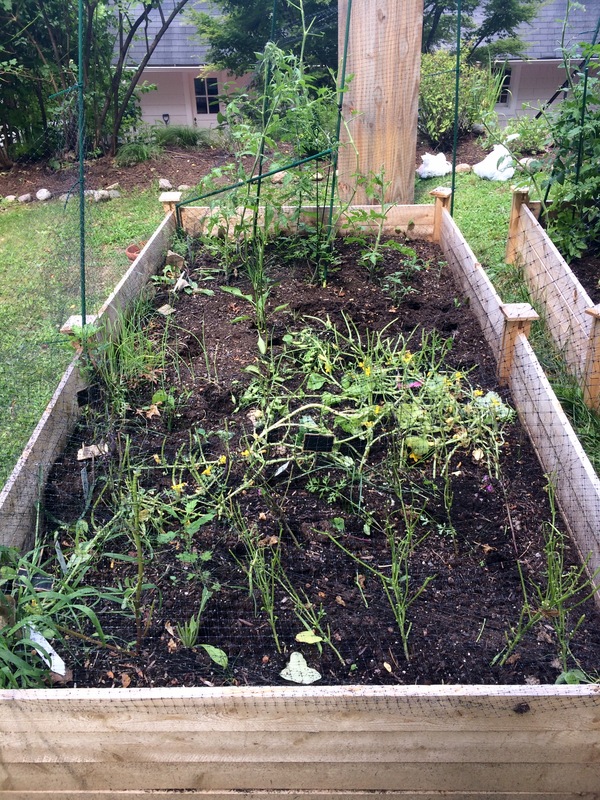 Deer, woodchucks, rabbits, tomato-horn-worms, potato beetles. There’s a looong list of garden enemies! But nothing beats the taste of fresh picked veg, so the battle continues! Have you tried Hendricks, cuc, mint & tonic? Summer in a glass! Oh no! I completely relate. Our current house backs up to woods and when we moved in, we thought the deer were cute. We know better now! I joke that my husband built me Ft. Knox for my garden. My parents’ garden used to be mowed down by deer. They had to put a covered netting around the whole thing, and then my dad cut a door in it so they could get in to pick the veggies and pull weeds, etc. Only way to prevent it, unfortunately. How did the pioneers keep wildlife out of their fields and gardens?!? Last summer the rabbits even ate my flowers. This summer I admitted defeat before I started and have been a loyal customer at my local produce stand. Guns, I’m afraid. It provided the protein to go with the veg. I’m a vegetarian so it hurts to think about. We have a motion-activated sprinkler that works well in keeping the deer from doing too much damage. They might get a little nibble around the edges, but no crop has been wiped out since we got it. Look for DIGOO AK7 2 on Amazon. Agh. Disaster. In order to soothe your soul, I am sending you my own summer gin recipe. Called a Thrice Blessed, try this: good shot of gin, small shot of Elderflower Liqueur, rose water/rose syrup (I make my own rose water so it is simply made of roses, water and sugar) and then top with cold, cold tonic. Ice and – here comes the summer…. – some nasturtium flowers and borage flowers. Sit down and drink it. Soon, sanity will return. You are most welcome. Sorry about the vegetable garden massacre. Perhaps this is a good time to revisit a classic Joyce Wadler column from the NYTimes, “Peter Rabbit Must Die” (http://www.nytimes.com/2008/06/05/garden/05animals.html). Oh DEER!! I’m sorry to hear of your garden catastrophe. Although we live on a decent-sized half-acre lot in Northern Virginia, we grow edibles mostly on our patio/porch that is three steps up from the lawn. Even then, the deer are so brazen they come up the stairs sometimes if we forget block them with chairs. My bigger concern lately is with the threat of lyme disease from deer ticks. My children lived in our yard growing up, but now I’m so fearful of allowing our three-year-old granddaughter to run around. The struggle of man vs. nature is real, even as we revel in it and seek to protect it. Enjoy your drink, and I look forward to trying some recipes other readers generously provided! My husband bought a pellet gun to kill the squirrels, after trying everything. That motion detector spinkeler someone mentioned below looks promising! We have been away for the weekend. My husband asked me if I had been back to see the garden yet. I have not. I just can’t bear to see what the deer and bunnies have devoured in my absence. Jenny, my heart goes out to you. Earlier this spring, I had my entire crop of kale and collards wiped out only one day after I planted the seedlings. I suspect squirrels. I always suspect squirrels. They are the bane of my existence. Anyway, last weekend I arrogantly replanted my stolen two rows of greens, thinking I could avoid similar devastation. No haps. Both rows were gone when I got home from work on Monday evening. It’s like they waited for my car to pull out of the drive and then said, “now WE go to work.” The bastards left me two handfuls of scallions and one lousy cucumber. Which I am now hoarding. It’s so hard. To keep your garden safe from deer, you need metal fencing at least 7-foot high or electrified. Other creatures, such as rabbits and woodchucks, an elevated bed ( table-height, preferably 4-feetx8-feet, afoot deep) works wonderfully. I had three of the elevated beds right outside my kitchen door and never had any problem growing an abundant kitchen garden. My in-ground garden produced the fattest woodchuck known to man! Jenny, don’t give up! Even right now, with Summer waning, you can plant a Fall garden successfully. Your birthday garden box is lovely! What I recommend is attaching a few three to four hoops along the side, 4-foot high. Then attach strong chicken wire to the hoops in such a way that there are no openings where critters can enter but designed in such a way that each side can be lifted when you plant, weed, and harvest. When frosty nights start coming, you can attach season-extension covering and gain a month or more of production. Crops to consider are ones that you can begin harvesting in 30 days and go on for a few weeks: a variety of greens including arugula, lettuce, pea shoots, radish, spinach, kale, scallions. I’d also seed carrots, mâché, beets for beet greens,. As Winter approaches, place a straw bale on the carrot patch and keep harvesting throughout the Winter. Carrots become extra sweet after frost. You can also over-winter some lettuces and spinach if you keep a heavy plastic covering the hoops, raising it on sunny days. Eliot Coleman’s “Four Season Harvest” is a wonderful resource, I encourage you to fully enjoy your birthday garden. You and your family will greatly benefit.